Galaxy S5 (Lollipop): How do I set up and use speed dials on my Samsung Galaxy S5? You can assign up to 99 speed dial locations on your device. Speed dial location 1 is reserved for voicemail and cannot be changed. 1. From the Home screen, touch Apps > Phone . 2. Touch More options . 4. Touch one of the available speed dial locations in the list. 5. 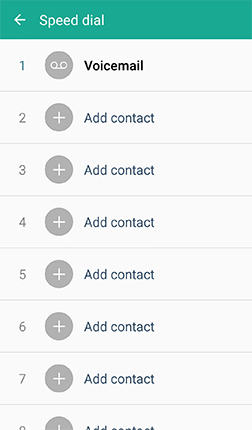 Select a contact from your contacts list. If multiple phone numbers exist, you will be prompted to select a specific number. You can quickly assign a speed dial to one of the locations on the keypad (2-9). 1. Touch and hold the desired number on the keypad. 2. You will be prompted to assign a speed dial, if none has been assigned. Touch OK.
3. 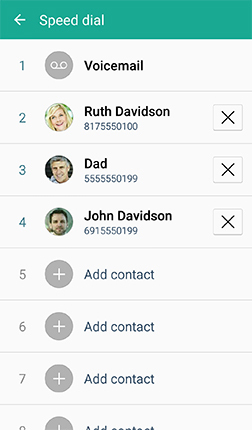 Select a contact from your contacts list. 2. Touch and hold the keypad number to start the call. 2. Touch the first digit of the speed dial number. 3. Touch and hold the last digit to start the call. 4. For example, if you want to call speed dial number 25, touch 2, and then touch and hold 5. 4. Touch next to the speed dial location you want to remove. What are the different call answer and end options on my Galaxy S5? Galaxy S5 (Lollipop): How can I increase the call volume on my Samsung Galaxy S5?